August was actually a really good month. I mean a GREAT month. Now that we went to Chicago....and we're back... I woke up this morning with the blues. One, my husband isn't here. He went back to work. Two, it's September. Which means.. Sometimes in my life-I really take time for granted. I really forget how blessed I am. I don't often stop in my tracks and get that warm fuzzy feeling in my heart. If you follow my blog... you know that I've had a rough time since Boston has been born. The changes in career, location, BODY, life... it put me in a very bad place. I was always so sad. So depressed. Lonely. Oh my gosh. I haven't blogged in a few days. Why? I know you miss me and ask? Cause I have had the WORST sore throat EVAH! I honestly feel like I'm back in grade school. Except... now I'm the mommy and my mommy isn't here to take care of me. It's been a great sign and appreciation for my own mom. Mom's still have to be Mom's even when they are sick!! I went to the doc this morning and she told me "Yep. You have strep throat. Probably the worst I've ever seen in an adult!" That's nice. Especially since it's so stinkin' contagious. She said the only way someone can get it is if I swap saliva. Now.. mind you.. my hubby doesn't or hasn't had it... so who have I been making out with??? Great question. I sure would like to know. Lucky for him... I haven't been a kissin' him either. So... my blog has been neglected. Today-I got my first dose of antibiotics and I have slept all damn day! I guess now I can share a few fun things from the weekend. Friday night.. we laid low. Didn't do much...no big deal cause we never do much obviously cause I wasn't feeling great. Saturday... we went to our neighborhood fall fest. Last year was the first year they did it and it was awesome! And here is some from this year. It's wild how much a kid changes in a year! B was DJ Lance Rock and so was Momma! We had a little gathering in our neighborhood then the kids went trick or treating. I felt the WORST ever and so Boston just sat on the steps with me and handed out candy. Um. I had a TON of candy. Overall we had fun... check back soon for videoblogs. I'm just in misery so my mind is half dead right now. I feel so bad... I got so busy working-the getting canned-I haven't bought "B" a costume yet!! We went into one costume store a little while back... and he got freaked out. I don't really understand it. Who on earth created the ghoulish, sick and scary idea of Halloween? I know. Just google it. And Men think WE have Attachment Issues? Yes. I love to 'keep' sentimental things from ex's.. even though I shouldn't. Or silly reminders of a fun memory. It's so bad. When the dog comes upstairs-he jumps on the bed and ROLLS IN IT!!! It stinks. 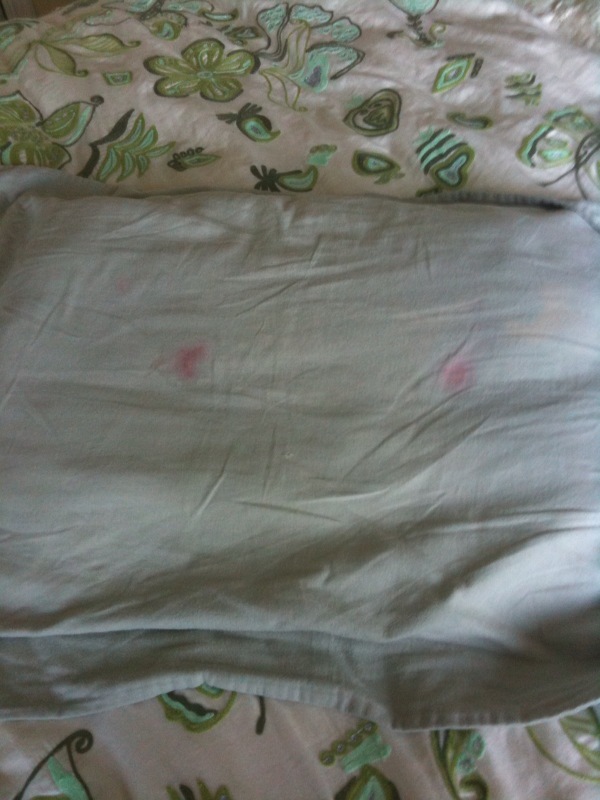 Yet he continues to wash the pillow case... yet the STINK STAYS!!! What silly attachments does your hubby or man have?